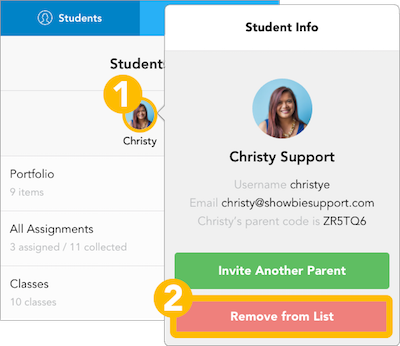 Before you start, this guide is for parent accounts only and removing students from their account. If you are a teacher and would like to remove students from your class list, please read this guide instead. Please read the message carefully! Don't see the same options as the screenshot above? This guide is intended for parents who would like to remove students from their account. If you have a teacher account, you won't see the same options as above. If you'd like to remove students from your class list, please read this guide instead.